How do I use my Folders in Report? 'Folders' is our campaign level organizational tool. 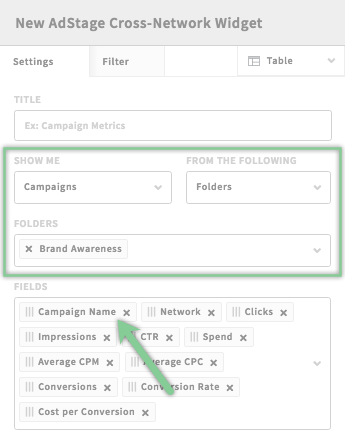 This is a great way to group campaigns (cross-network) into one organized grouping. When you use Folders in Report, you can bring one, or more, folders into any widget. Designed for: All advertisers working with multiple campaigns. Benefits: Easily keep your data organized in similar themed views. Group by marketing objective to align cross-network campaigns fighting for the same goal. Step 1: Start a new widget or edit a current widget. Step 2: Set the Entity Level to Folders. Step 3: A new field will populate below. Select one or multiple Folders. Folders function at the campaign level, where campaigns will be aggregated together in a single group. Thus, Report uses the campaign entity level when Folders are selected. You can include more than one Folder in a widget. You can only see Folders that you have created. Folders are not shared with your teammates. Have you created Account Groups? Learn how to use Account Groups in Report.